Neighbourwoods© was developed by Dr. W.A. Kenney and Dr. D. Puric-Mladenovic to assist communities and professionals in collecting the tree information they need to strategically plan and manage their urban forest. Since its inception in 1995, Neighbourwoods© has been used and applied by many communities across Ontario and beyond. The three components of Neighbourwoods are: a) Tree inventory, monitoring and mapping procedure and training b) tree inventory data analysis c) urban forest stewardship and management planning. Trees are valuable natural resources that improve the quality of life in our communities and make our neighbourhoods greener and more livable while providing many other social and ecological benefits. With an increasing need for greener and more sustainable urban communities, there is also a growing awareness of the value of trees in urban landscapes. Associated with this awareness is the recognition that sustaining the urban trees and their many benefits is only possible through strategic and long-term urban forest management, planning and conservation across our cities, towns and villages. However, when addressing this need, we are often confronted with the lack of meaningful and stewardship-relevant information which can help us make informed, evidence-based decisions. Within the North American urban land-use pattern, the majority of urban trees are on privately owned lands that include residential, commercial, institutional and industrial areas. For example, although residential areas constitute 50% to over 80% of the urban land base (depending on the type of urban development), most municipalities do not have detailed information about the trees on private property, nor do they actively manage this part of the urban forest. Municipalities simply don't have the resources or jurisdiction to manage privately-owned trees. One exception to this is the implementation of private tree by-laws. Neighbourwoods is a community-based approach to the planning and implementation of the stewardship of the urban forest in your neighbourhood including all trees and remnant woodlands. While the focus is on trees on private property, Neighbourwoods considers the urban forest of a neighbourhood as an ecosystem including both private and public lands. To address the gap in information about privately-owned trees, the first step is to conduct an urban forest inventory that will enable gather data about the extent, composition and condition of the trees in our neighbourhood urban forest. 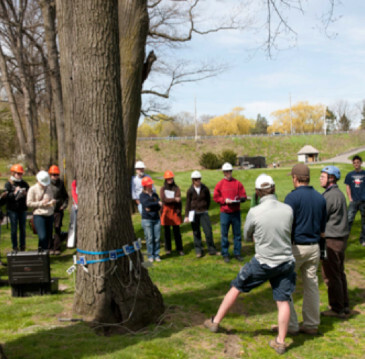 An effective urban forest inventory must be more than just a list of existing trees. Firstly, it should provide information to meet overall stewardship goals for the urban forest, as well as goals specific to the maintenance of individual trees. Secondly, it should provide information about the role of the urban forest in improving the local and regional environment. Thirdly, an inventory should provide an effective public education program that will help residents, professionals, and policy makers better understand the urban forest and its needs. c) To inform individual tree and urban forest stewardship based on sophisticated tree analysis and advanced data interpretation.